The weekend after the Thanksgiving holiday, Yahoo posted a list of health benefits that various spices are purported to have. Everything from soothing an upset stomach to boosting metabolism to helping with arthritis. While this may be new news so to speak to some, particularly in this era of pharmaceuticals and treatment of symptoms rather than focusing on well being through food, it is certainly not news to many ancient cultures who long relied on spices for medicinal purposes. Having spent time in Morocco and in spice shops there, and having done quite a bit of research on the topic during my days in graduate school, I have long been an advocate of spices for both their health benefits as well as their culinary benefits. One of my favorite memories of our first trip to Morocco in 2002 was a trip to a spice shop in Fez where the shop keeper spent almost 3 hours with us discussing what each spice did both medicinally and culinarily. It was fascinating. What it taught me most was to not be scared of using spices and using a LOT of them. In my cooking classes I often use spices that are maybe somewhat foreign to people and I am always impressed by the gasps I get from people when I add them. I don’t just throw a pinch in, I through a palmful in. So many people are afraid that they will over spice something when in reality, that is almost impossible to do. My rule of thumb is, if you think you are using too much, that’s probably just enough. My favorite go to spices, besides Herbes de Provence which is a spice blend from France that I use in many things (thyme, savory, chervil, tarragon, lavendar and often marjoram and rosemary), are cinnamon, Hungarian Paprika (Sweet, Hot and Smoked), freshly ground nutmeg, saffron, ground ginger and cumin. All of these spices are uniquely beneficial to your health and have very specific uses in cooking that people often don’t know about. Cinnamon, besides the obvious uses in desserts, is a fabulous addition to savory meat dishes. It is very common in north African and Middle Eastern cuisines to use cinnamon with meat and dried fruit. It is also purported to help with digestion and perhaps even regulate blood sugar. There are a number of different kinds of cinnamon but my personal favorite is the Vietnamese kind. It is pungent, spicy and has a powerful fragrance that makes my mouth water. Most people think paprika is only good for garnishing deviled eggs. However, I beg to differ. It is one of my favorite spices to use for general flavoring of soups, stews and meats. Hungarian paprika is not just one spice but a myriad of different varieties ranging from sweet/mild to smoky/hot. In my humble opinion Hungary produces the best quality paprika in the world, although Spanish paprika is also well known. Hungary has the following classifications for paprika: Kulonleges or unusual paprika which is often sweet and has a very dark red color Csípősmentes Csemege or slightly spicy but still ordinary paprika which is just a little stronger Csemegepaprika which is the most common varietal Csípős Csemege, Pikáns which is the spicy version of this basic paprika Rosza or rose colored paprika which is slightly milder Édesnemes or Sweet paprika which is probably the most exported varietal Feledes or half sweet which is a medium strong paprika Eros which is a strong paprika All of these can be smoked with varying results. Generally, if I am making a soup, I prefer slightly spicy/smoky types of paprika which give soups a great kick. When cooking vegetables or side dishes I use sweet paprika. When doing meats, you can go both ways, just depending upon how spicy you want your meat to be. Beef/pork often benefits from smoky varietals while chicken or fish generally taste better with sweeter varietals. From a health perspective, paprika is very high in vitamin C and research has shown that naturally occuring capsaicin in peppers is actually good for circulation. Nutmeg is one of my secret weapons when it comes to savory items which often comes as a surprise to those in attendance at my cooking classes. Most people perceive nutmeg to be a sweet spice, something used in desserts like pumpkin pie. AND, most people don’t realize that the already ground stuff doesn’t taste a whole lot like anything. Freshly grated however nutmeg is a revelation. Not a nut in the true sense as the name suggests, nutmeg is actually the seed of a specific kind of evergreen tree. The coating surrounding the seed is peeled away and ground into a spice called mace which is used a lot in Middle Eastern cooking. My favorite application of freshly grated nutmeg is with mushrooms and any green leafy vegetable such as spinach, chard, collard greens or mustard greens. It gives them a brightness of flavor and smell that is unique and really complement both. Therapeutic uses of nutmeg may include pain relief and gastrointestinal discomfort relief. The most expensive commodity by weight on the planet is saffron. This spice is actually the stamen of a specific kind of crocus flower and because these little strands have to be harvested delicately with tweezers by hand it takes an awful lot of effort to create just a small quanitity of the spice for culinary use. 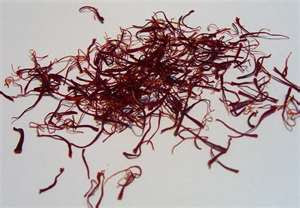 Saffron has a delicate floral flavor and it provides food with an incredible yellow/orange color. Perhaps its most famous use is in the traditional Spanish dish Paella. Saffron has no substitute, especially not turmeric, which has a completely different flavor and can be quite aggressive and overpowering. Also, beware of saffron powders. These are often not pure saffron but an imposter that attempts to lure you into thinking you can get the same bang for a lesser buck. I use saffron in soups and stews of all kinds and a little goes a long way so while it seems like you are spending a fortune for a little bottle of it, it will last you quite a while. The myriad of health benefits that saffron has been purported to posess are numerous, including anti-cancer, increased circulation, reduced inflammation, improved eyesight and anti-depression. Another spice that is often associated with sweet dishes is ginger. However in North Africa, the Middle East and in many Asian cultures, ginger in both its dried and fresh form is an essential spice utilized in savory preparations as well. Many soups, stews and even beverages are infused with ginger giving a gentle heat and spicy finish that is incomparable. At the Djemma el Fna food fair in Marrakech, the last stalls on the outskirts of the square were ginger stands, featuring ginger cakes and a ginger beverage designed to aid in digestion, which is one of the greatest health benefits ginger posesses. It can also help with allergies and colds by clearing your sinuses and soothing an aching throat. Really a jack of all trades in the spice world. Finally, cumin is a spice that most people associate with Mexican food and chili, but in actuality, it is very commonly used in North Africa, India and the Middle East. The varietal you find there is often less spicy or smoky and much milder and almost floral in nature. Cumin is often used in conjunction with paprika in flavoring savory soups and stews and is particularly good with meats such as beef and lamb. It is also one of the main ingredients in most curry powders. Cumin is another spice that is used frequently to treat gastrointestinal discomfort. I was told by the woman in the spice shop in Morocco that if I had a stomach ache I should mix a tablespoon of cumin with a little hot water and drink it and it would soothe my stomach better than pepto bismol. By George if it didn’t work. I had a little stomach discomfort after a particularly heavy meal and it did the trick within minutes. So as you can see, spices can be both delicious and healthy. Why not incorporate them into your daily routine? The benefits both from a culinary and a health perspective are a win win situation. Make sure you rotate spices reguarly and don’t keep them for longer than 6 months to a year. You can obtain high quality spices at a very reasonable price through www.zamourispices.com which is the purveyor I utlize the most. Eat well and feel well. Love, Love, Love saffron!!! These is NOTHING else like it! I just threw some in my turkey/vegetable soup that I made last night! Looking forward to class next week!